We’ve written in the past about how Azure Security Center helps detect malicious activity on compromised VMs, including a post detailing a Bitcoin mining attack and one on an outbound DDoS attack. In many cases, attackers use a set of malicious tools to carry out these and other actions on a compromised machine. However, our team of security researchers have identified a new trend where attackers are using good application to carry out malicious actions. This blog will discuss the use of known hacker tools and those tools that are not nefarious in nature, but are being used maliciously, and how Azure Security Center aids in detecting their use. Generally, the first category of tools we see after a brute force attack are the Port and IP address scanning tools. Most of these tools were not written maliciously, but because of their ease of use, an attacker can scan IP ranges and ports to find vulnerable machines that they can target. One of the more frequent port scanning tool that we come across is KportScan 3.1, which has the ability to scan for open ports as well as local ports. It has a wide range of uses, including working with any port as well as individual addresses and IP ranges. It is multithreaded (1200 flows), consuming very few resources on compromised machines, and the best part is that the tool is free. After running a scan, results are stored by default to a file called “results.txt”. In the example below, KportScan is configured to return all IP’s with the ranges specified that have port 3389 open to the internet. Other scanners that we see dropped on machines after they have been compromised include Masscan, xDedicIPScanner, and D3vSpider. These tend to be less frequent, but are notable. Masscan claims to be one of the fastest Internet port scanners out there. It proports to scan the entire internet in under 6 minutes with your own network bandwidth being the only gating factor. While Linux is its primary platform, it does run on many other operating systems including Windows and Mac OS X. The below command will scan for open ports on 3389 where the subnet range is 104.208.0.0 to 104.215.255.255, which is 512k worth of addresses. The results will be stored in a XML file called good.xml. xDedicIPScanner is another port scanner which is based on Masscan. It has many of the same capabilities as Masscan, but does not require a user to learn Linux as it is GUI based. Some of its features include, scanning of CIDR blocks, automatic loading of country range`s, small foot print, and ability to scan multiple ports or range of ports. It also has some application dependencies to run, they include Winpcap and Microsoft Visual C++ 2010. It also requires Windows 7 or higher. From our observations, xDedicIPScanner appears to be primarily used maliciously. The below example shows a country range being loaded in the tool for scanning. Finally, Pastebin D3vSpider is also a scanner we’ve seen often. D3vSpider is not a port scanner, instead it scans Pastebin repositories which are popular for storing and sharing text (including stolen passwords, usernames, and network data). The tool’s output is based on the user’s input search criteria, and provides information including user names and their passwords. The example below shows a scan resulting in 745 user names and passwords for a single month, this can then be exported to a txt file for future use, with other tools. For example, it could be used with NLBrute, which is a known RDP Brute Force tool. Recently, we have begun to see the use of messaging applications being used to drop other malicious and non- malicious tools. The messaging applications are widely used and not malicious in nature. They tend to be cloud-based messaging services, with support for a broad base of devices including both desktop systems and mobile devices. Users of the product can exchange messages, and files of any type with or without end-to-end-encryption, as well as sync the messages across all the user’s devices. Some of these messaging services even allow messages to be “self-destructed” after delivery, so they are no longer seen on any device. One of the features of these messaging applications is known as “secret” chat. The users exchange encryption keys and after the exchange, they are verified and can then communicate freely without the possibility of being tracked. These features and many more, have made these messaging services a favored addition to some attackers’ tool boxes. Their ability to easily drop files on to other machines appears to be one of the main reason attackers use this program. In fact, we started to see the presences of these tool on comprised machines as early as December of 2016. 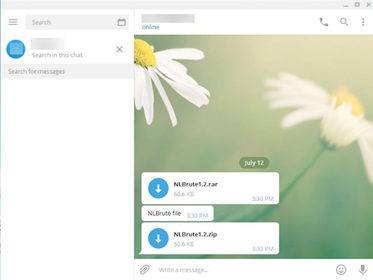 At first, we dismissed this as coincidence, but after further investigation we started seeing known hacker tools (NLBrute, Dubrute, and D3vSpider) show up on compromised machines after the installation of these messaging applications. 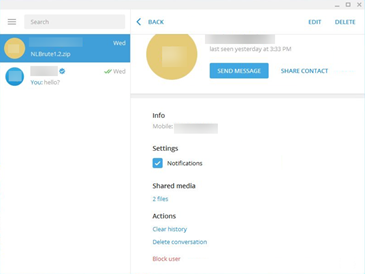 Since, these tools are capable of synchronizing messages across all the user’s devices, anyone that is part of the conversation can at a later time revisit a message to download a file or a picture. While the joining to a Channel is of interest, the files that appear on the machine after this is what is most interesting. These tools range from Crack tools, RDP brute force tools, and encryption tools which allow attackers to hide their traffic and obscure the source IP addresses of their activity. Below is an example of what we saw on a host directly after connecting to a private Channel. We’ve presented some of the more frequently seen tools favored by the attackers, and used on virtual machines in Azure. These tools were, for the most part, created for legitimate usage without malicious intent, however, because of their functionality and ease of use, they are now being used maliciously. While the presence of any one of these tools may not be reason for alarm, a closer look into other factors will help to determine if they are being used maliciously or not. For example, if we see more than one of them on an Azure virtual machine, the likelihood that the machine is compromised is much greater, and further investigation may be required. Seeing the tool’s usage in the context of other activity on the Azure machine is also very important in determining if these tools are being used maliciously. Ian Hellen’s blog on Azure Security Center Context Alerts describes how much of the tedious security investigation work is automated by Security Center and relevant context is provided about what else was happening on the Azure machine during and immediately before suspicious activity is detected. Tools like KportScan, Masscan, XDedicIPScanner, D3vSpider and malicious messaging services will be detected and alerted on by Azure Security Center Context Alerts. From the number of incidents investigated, the usage of legitimate tools for malicious purposes appears to be an upward trend. In response, the Azure Security Center’s team of analysts, investigators, and developers are continuing to actively hunt and watch for these types of indicators of compromise (many of which are simply not detected by some AV signatures). We currently detect all of these tools discussed in this blog, and as we find more we are adding them to our Azure Security Center detections. Microsoft recommends investigating the attack campaign via a review of available log sources, host-based analysis, and if needed, forensic analysis to help build a picture of the compromise. In the case of Azure ‘Infrastructure as a Service’ (IaaS) virtual machines (VMs), several features are present to facilitate the collection of data including the ability to attach data drives to a running machine and disk imaging capabilities. Review Applications: In cases where there are individual programs that may or may not be used maliciously, it is good practice to review the applications found on the host with the administrators and users. If it is determined that there are applications that may not have been installed by a known user(s), the recommendation would be to take appropriate action, as determined by your administrators. Review Azure Security Center Recommendations: Review and address any security vulnerabilities identified by Security Center, including OS configurations that do not align with the recommended rules for the most hardened version of the OS (for example, do not allow passwords to be saved), machines with missing security updates or without antimalware protection, exposed endpoints, and more. Defender Scan: Run a full antimalware scan using Microsoft Antimalware or another solution, which can flag potential malware. Avoid Use of Cracked Software: Using cracked software introduces unwanted risk of malware and other threats that are associated with pirated software. Microsoft highly recommends not using of cracked software and following legal software policy as recommended by their respective organization. Get the latest Azure security news and information by reading the Azure Security blog.